A NASA-funded miniature satellite built by LASP and University of Colorado Boulder students successfully launched to the International Space Station (ISS) at 2:44 p.m. MST on December 6 from Cape Canaveral, Florida, the start of a six-month-long mission to study solar flares and the powerful X-rays emitted by the sun. CubeSats are low-cost, short lifespan satellites built to take specific scientific observations and measurements. The MinXSS measures approximately 4 inches wide by 4 inches long by 12 inches high—about the size of a loaf of bread—and features cost-saving components such as an extendable tape measure that will serve as a radio antenna. The MinXSS was hoisted towards a December 9 rendezvous with the ISS atop a United Launch Alliance (ULA) Atlas V rocket. In November, the Centennial, Colorado-based ULA announced that CU-Boulder will receive a free CubeSat ride to space in 2017 as part of the aerospace company’s new initiative to make CubeSat launches more affordable and accessible to academic institutions nationwide. Once delivered to the ISS, the MinXSS CubeSat will be deployed into space in late January 2016 and operate for up to 12 months. CubeSat deployments from the ISS via a specially designed CubeSat deployer are made possible through a Space Act Agreement between NASA and NanoRacks LLC. 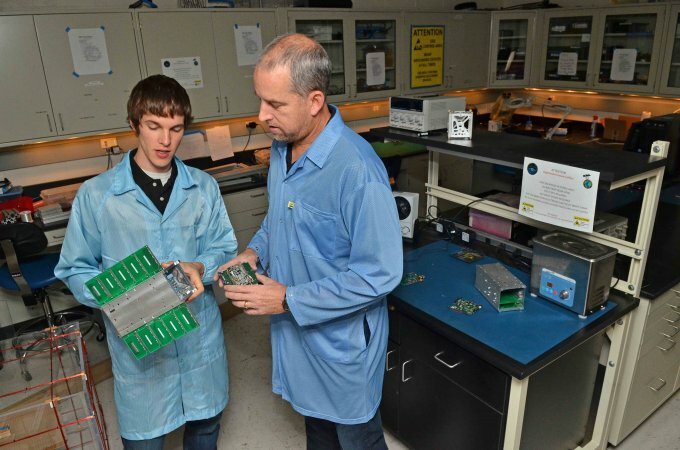 The MinXSS mission continues a successful tradition of CU-Boulder students designing and flying CubeSat missions, including the Colorado Student Space Weather Experiment, which launched in September 2012. Over 40 students have worked on the MinXSS, including Colden Rouleau, a first-year PhD student in the Department of Aerospace Engineering Sciences at CU-Boulder. CU-Boulder’s AeroSpace Ventures partners with industry to accelerate discoveries in Earth and space science, broadly educate tomorrow’s highly skilled workforce, develop technologies that create new commercial opportunities and create collaborations that help industry grow. Founding corporate partners include Ball Aerospace, Blue Canyon Technologies, Braxton Technologies, Lockheed Martin, Sierra Nevada Corporation and Surrey Satellite Technology U.S.
To keep itself orientated toward the Sun correctly, the MinXSS will incorporate an XACT attitude determination and control system built by Blue Canyon Technologies, a Boulder, Colorado-based aerospace company founded by CU-Boulder graduate George Stafford. The MinXSS will be the first CubeSat to use the full XACT system and there are approximately 10 other CubeSats planning to launch in 2016 with an XACT onboard, said Carton.